Killer Characters: Do You Love A Party? Do You Love A Party? I'm excited and a little apprehensive. My pal Meredith--you know, the elementary teacher who taught the twins last year--invited a bunch of artists to town. Why? Because she wants to throw a fund-raiser to raise money so she can turn an abandoned winery into an institution of higher learning, and she wants the artists to commemorate the event. I'm not apprehensive about Providence having its own liberal arts college. I think that's a grand idea. But having the fund-raiser in the abandoned winery? Or setting the college on the property? Yipes! The deceased winery owner was a little nuts. He built a huge mansion above the winery, and there are rumors about the place. Meredith thinks I'm silly to worry. I'm doing my best not to, but at times, I have an overly active mind. Putting that aside, Meredith asked me (and by me I mean Fromagerie Bessette) to provide food for the fund-raiser. I planned a spread of cheeses and appetizers, and I was all set to go, but at the last second, Meredith asked me to prepare fondue. [I nearly snorted out loud. Fondue? It is not the easiest to meal to make for fifty-plus people. A little soiree of six to eight is perfect. But fifty?] I said yes, of course, because I'm a pushover when it comes to my friend. Her enthusiasm catches me up in the moment. Tonight's the big night. The artists have arrived in town. They're college students--a little wild and very intense. I used to babysit one of them: Meredith's niece, a real beauty and so talented. Their art teacher (who is also the chaperone) happens to be Meredith's brother. We had a moment of attraction way back when we were kids. He's happily married now. So anyway, we're all set. We've got the vans packed up with fondue pots and forks, plates, platters of things to dip into the fondue like bread cubes and potatoes and fruits and vegetables. Oh, and did I tell you that Meredith wants to have a scavenger hunt in the manor? Why did a shiver just run through me. Sheesh! Tell me, there's nothing to worry about, please? I'm making more out of the history of the old winery than I should. The rumors about buried treasure and buried bodies are just that...rumors...right? I should just plant a smile on my face and say, "Cheese." Right? LOST AND FONDUE launched yesterday. A SNEAK PREVIEW and BOOK TRAILER of LOST AND FONDUE are now up on the website. If you'd like to order LOST AND FONDUE, click this booksellers link. It's available on Amazon, Barnes and Noble, and independent booksellers. 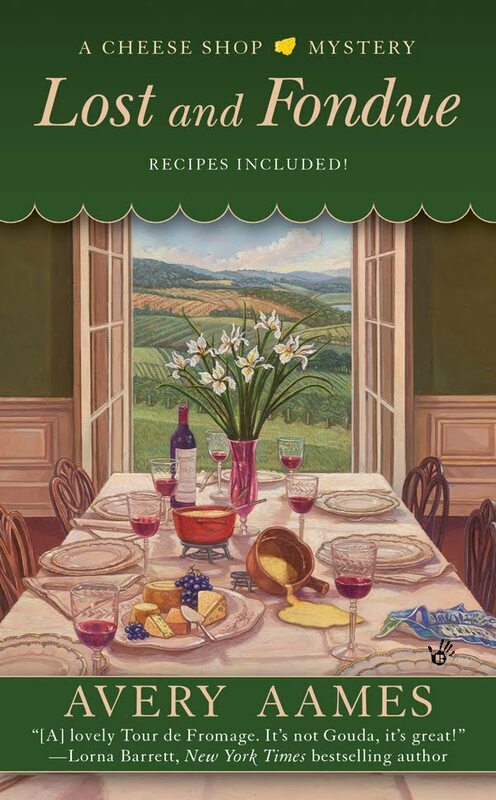 If you'd like to know more about A Cheese Shop Mystery series and want to download a few other recipes from me (on recipe cards - including FONDUE), click here: RECIPES. Be sure to catch me at my other blog Mystery Lovers Kitchen, on Facebook, and on Twitter: @AveryAames. Charlotte, I think everything will be great. I would just enjoy the ride and as I suspect there may be a little murder to solve. Congrats to Avery on her book release. And congrats to Avery for winning the Agatha for the Best First Novel, too! She couldn't have done it without you and your amazing adventures, Charlotte. I hope everything goes well at that fundraiser, but I'm a little apprehensive about it. Now what leads me to think something mysterious might happen? Hmmm. Good luck with it all, Charlotte. And, congratulations to Avery on her wonderful win! Dru, you are a very clever woman. I suspect you are right. Janet, aren't you sweet? I'm not sure my adventures are amazing, but they are a little out of the ordinary. :) Meredith keeps saying, "Don't worry." I have to trust her, right? And Erika, mystery seems to come at the most odd times. I'm not sure why that is. But I try to be flexible. Great title, I love fondue! So much so, I just ordered your book. Can't wait to read it, yum! Everything will be lovely,I'm sure. What a fun idea and I can't wait to find out how it all works. Oh, I would imagine something will happen... you did notice where we are, right? At 'Killer Characters'??? Bound to be another win. Good luck. Mare, I suppose you are right. Um, yes, Victoria, that makes me a little leery. Charlotte, you're a hoot! Just sit back, have a glass of wine, and nibble on some cheese. You'll feel better :-) And don't forget...Avery always has your back.